Divorce without Court – What is Collaborative Family Law? Going through a divorce can be one of life’s roughest passages. At times you can feel overwhelmed with emotions such as anger, sadness, depression and this might affect your capability of being able to think clearly or make good choices. You may also feel very far removed from your usual competent, thoughtful, considerate, reasonable, fair-minded, resilient self. However, during this time you will be asked to make some of the most important decisions that can change your life. Thinking clearly about what kind of divorce you want can be an unfamiliar concept. Most people are surprised to learn that the choices they make at the start of the divorce process has a great impact on what kind of a divorce experience they will have. Because of this, we provide a collaborative, fixed fee approach to divorce applications, making these times easier on everyone involved. You have probably heard some horror divorce stories from your family and friends where one party took everything and left the other party with nothing or that they went to court and all they ended up with was an expensive legal bill. Going to the Family Law Court is not just expensive, it is also a hurtful and damaging process. By placing your family in the court process you are essentially resolving your dispute through competing predictions of what a judge would do rather than focusing on what you and your partner can agree on. Luckily, there is another way to resolve your dispute without the need of going to court. 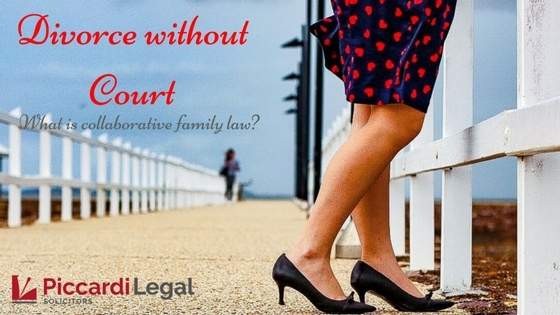 Collaborative family law is not a new concept, it has been around for almost 28 years. Collaborative divorce helps you prepare for the emotional challenges and changes associated with divorce and provides you with the resources to help you make a healthy transition from married to single life. There are 5 stages of a collaborative divorce. Throughout the process there will be a series of meetings between you, your lawyer, your spouse and your spouse’s lawyer. These meetings will be carried out over the course of 3 – 6 months and usually last for 2 hours. 1. Diagnose – This is an ongoing phase through the collaborative process. You and your lawyer will work together to identify the issues that need to be resolved (i.e parenting, property, etc) and also the goals or interests that are important to the parties. 2. Gather Information – At this phase you and your lawyer will gather all necessary information you are required to provide by law and information that is personal to you to help understand what is important you and your family. This information might include bank statements, tax returns, valuations for real estate or businesses. In relation to your children, information may be needed from their school, counsellors etc. 3. Educate – Once phase 2 is completed, your lawyer will provide you with preliminary legal advice and help you brainstorm options for solutions and evaluate the expected outcomes of choosing each option from emotional, financial and legal perspectives. At this phase you may consider engaging a neutral third party such as an accountant, financial planner or child psychologist. A neutral expert can assist in problem solving at the collaborative meetings. 4. Resolve – Your lawyer will assist you to negotiate a collaborative agreement which satisfies your goals, interests and concerns and will also be acceptable by the other party. This way a win/win agreement is reached. At the final collaborative meeting you and your spouse will table your preferred solutions and negotiate an agreement. 5. Document – The final stage is to document a legal agreement that reflects the agreed settlement terms to finalise your legal matters. This can include an Application for Consent Orders or a Financial Agreement. You will each need to meet with your lawyers to obtain advice in relation to the documents. Is my matter suitable for collaboration? Collaborative family law is not suitable for everyone. An essential element of the process is that there is a shared willingness of both parties to resolve the dispute. It is also a great option for parties who wish to retain a level of control in their matter and want a dignified, non-aggressive resolution to the issues at hand. Collaborative family law is not suitable for parties wanting to “seek revenge” or think that by adapting this process full and frank disclosure is not required. We offer fixed fees for divorce applications from $880.00. It is essential that both parties retain a collaborative lawyer. You can find collaboratively trained lawyers by visiting Queensland Association of Collaborative Practitioners . Our family lawyer, Megan Piccardi, has received collaborative training and is passionate about helping her clients reach settlement without the need for court. If you are interested in collaborative law or you think that your matter might be suitable, please contact us today to arrange an initial consultation. Contact us to arrange a chat with one of our talented and friendly legal professionals.